Figuring out what to write about in your articles can be an uphill battle. Determining how to get your points across in the most effective way is no small task. Remember that there is power in the words you choose. Next to learning how to pick the “right” topic, self-editing is the skill that every successful writer has to master IF they want their articles read from top to bottom. So, after you’ve successfully laid out your points (and maybe added an important stat or funny joke or two), you’re not quite ready to show it to the world, not until it has had a good edit. Does that mean you have to hire an editor? Not necessarily. For most of our clients, some pieces get a professional edit, but many others fall into the “do-it-yourself” category and that means, the writer has to do the edits themselves. Good and in-depth self-editing can make the difference between growing an audience of loyal followers or alienating them. As you craft your masterpiece, it’s common to tell people about your services, just don’t forget to show them. You can tell your reader how your services have changed people’s lives. But that doesn’t actually teach your potential audience how you can authentically help them. If you show but don’t tell, you’ll invoke powerful feelings that are required to actually sell your craft, but you won’t get the deal done. The reason is that you will have missed the chance to really educate your readers about how you can help them specifically. To help make your case, use strong action verbs in your writing. Words like “empowered, navigated and advocated” are stronger than words like “taught, led and supported”. And never tell your audience how to feel. That’s a true no-no. You will be amazed at how many mistakes you catch when you read your finished article out loud. It’s the old and tested rule that many English teachers would advise their students. After writing an article, set it aside for a couple of hours and tend to your other tasks and chores. You will rarely ever get a good edit (or fair one) if you edit it right after you finish writing it. Once you come back with a fresh set of eyes and re-read what you wrote, you’ll see a lot of things that you may have missed. Reading out loud also allows your voice to catch typos or grammatical errors that may be properly spelled but are still incorrect. This is especially true for commas. You will hear the natural pause you make when reading something that needs a comma alerting you to where one may be missing in your writing. Do a thorough proof-read for spelling and grammar. Autocorrect has definitely come a long way. With it, we can correct misspelled words, easily. But autocorrect can’t best your self-editing skills! When you’re done writing, give it a thorough proof-read. You can also download a spell-check plug-in, like Grammarly (LINK: https://www.grammarly.com), that will automatically highlight words as you go if they’re spelled incorrectly or your grammar is off. Spice up your word choice. Pay attention to your sentence structure and word choice. If you’re starting your sentences the same way over and over again or you keep using the same adjectives to describe a situation, try to identify those common phrases and choose new ones. After all, no one wants to read the exact same thing in the exact same way over and over again. So while editing, try to spice up your writing by using a thesaurus or playing around with the format and sentence structure. This is also a good time to make sure any jargon or lesser known terms are well defined upon the first mention. If you don’t want to spend time defining industry words like “ruminate”, replace it with a more common synonym like “obsessive thinking”. You don’t want your readers to need a masters degree or higher to understand your point. More words don’t necessarily make a piece stronger. Sometimes, you’ll need to delete extra details or tangents in order to focus your content more tightly to the headline. In this area, look for redundancy and eliminate it unless it serves a clear point that can’t be made without some repetition. Not only does this help keep your article more targeted, but it can help you avoid losing readers by either overwhelming them with information or by losing their attention with a side thought that’s less relevant to the main points. Is your headline clear, relatable, and interesting? Does your article deliver on what you’ve promised the reader they’d learn in the headline? Does your tone sound conversational or is it too stiff, academic, or enlightened sounding? Have you avoided using professional jargon or defined it when necessary? If you’ve included statistics, studies, or other data points, are they substantiated with links? Did you include a strong Call To Action? Is your article a minimum of 500 words? Have you made certain to stay as on target as possible? Have you removed double spaces, capitalization of words other than proper nouns or titles and checked to make sure your writing is as clean as you can make it? 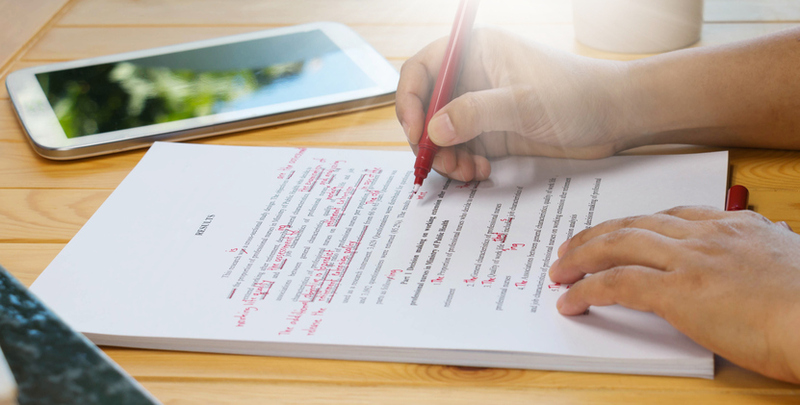 These skills for self-editing are more important than you might imagine. Mastering them will take your writing to the next level and you will see increased readers, engagement if you share it on social media and conversions based on your call to action. Just remember, no one gets this right immediately. Writing, like all things in life, is a practice. The more you do it, the better your results will become. If you need help with either self-editing, learning the right topics to include in your content marketing or which search strategy can make the biggest difference for your business, please reach out. We would be happy to spend some time with you and explore how to create the greatest wins for your counseling, coaching or healing business.